So you are all set with your gloves, spade and trowel! 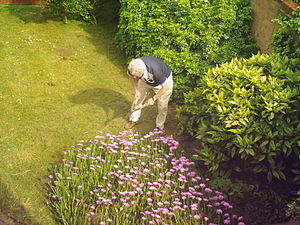 Maybe its just a bit of pottering or a full day’s work of tidying and digging and pruning. You’ve planned this day or most probably just decided to ‘have a go’ on the spur of the moment. You know you’ve got a few hours or you haven’t given time a thought. Before you know it the children are home from school or the sun is going down or the rain has come! You come in from the garden. A cup of tea later you feel the familiar strain and pain in your lower back. You know that it means an uncomfortable evening and then hopefully it will be gone. Maybe you know it means longer than that, days of pain. But the garden looks great! Here’s the plan – next time you venture out, add 15 – 30 mins repair time for your back onto the end of the gardening session. Easy to say but if like me you often do things on the spur of the moment, get carried away in the execution until you’ve squeezed every last drop of time out of that final 5 minutes before you are needed for the next task, its hard to put into practice! However, when you have experienced how this repair time can actually free you from the evening/days of pain you come to actively want to include it! Horror of horror, a plan! So you’ve left the garden, you have 30 mins or so where no one needs you. You’ve drunk your tea. Try one of the following two resting positions depending on whether you like to rest in bed or on the floor (probably an easy choice, but if your bed is very soft consider the floor!). The first is in bed – lie with your neck supported by your pillow (if your pillow doesn’t have neck support, roll up a hand towel and put it in the pillow case to support your neck). Get the biggest and tallest set of pillows that you can and put them under your knees so your knees are pointing up to the ceiling and your lower legs parallel to the bed – i.e your upper and lower leg make right angles to each other. Then just relax for as long as you can. This position takes the strain off your lower back and is very relaxing! The second is the same position but on the floor. You can also do this with putting your lower legs up on a chair seat and your bottom next to the chair legs. Just remember a nice warm blanket to put over your top half. Relax. You can always try the ‘Back Ironing’ technique before and after as well. Try it and see how it feels!